It is a kind of truism that the past comes to us through some combination of testimony (oral or written), images, written documents, and artifacts. Of course, the previous things are just words, and exactly what an artifact is, and what an image is, or whether on some level we could consider all such things as documents of the past is not precisely clear. However, it is in this broad sense that I wish to ask: what kind of historical document is a musical score, and how might one go about extracting information from it - and what kind of information might that be? We are familiar with documents that say such things as: The King of So and So paid three bottles of fine wine and three geese to the composer Monsieur X. Once we go through the tiresome, but necessary, process of verifying the document's provenance, we may conclude that someone wrote this statement on such and such a day, and unless we can think of a compelling reason why the document might contain mistaken information or be deliberately misleading or forged, we imagine that indeed, it is as it appears. Then we can check it against any other information that can be similarly verified and see whether any kind of coherent picture emerges, albeit of limited practices within a certain time and place. In the end, though, there is a great deal of guesswork involved in connecting these historical points in space, and in this cosmic game of follow-the-dots some will see rectangles as they connect four points in historical space, while others will insist that they have produced the Mona Lisa. At the outset I should say that I favor the rectangle, and admit freely that for the most part we really haven't the faintest idea of what happened in the past, whether it was five minutes ago, a century ago, or a millennium ago. The four, or ten, or one hundred points we have in historical space are four or ten or one hundred out of billions. Even if we come to believe this, it is only when we raise the stakes and endeavor to render a real piece of the past present that we begin to understand that the actual, lived past is farther away than Mars; even the future is easier to imagine. For this reason, I'd like to use an urban metaphor suggesting how we might approach the past. In New York many people commute regularly on the subway, and many have learned how to sleep while on board. But one must be somehow vigilant lest one miss one's stop. So a recognizable pattern of subway sleep has emerged. The passenger appears to be sleeping, but keeps jerking awake every few minutes, or even every few seconds, only to nod off again and again. So too, when we think we have the past within our sights, we need to jerk our imaginations, again and again, reminding ourselves that reassembling it is not so simple. Nevertheless, I'd like to take you back to the year 1944, and to a very strange place called Terezín, located in what was then northern Czechoslovakia. In 1944 it was officially known as Ghetto Theresienstadt and had been functioning as a concentration camp for almost three years. In 1943 it had become a significant propaganda tool used by the Nazis, who beautified it both to fool the Red Cross into thinking that all was well with the Jews and to serve as the basis for a particularly horrifying propaganda film for the same purpose, (available on YouTube; search Theresienstadt propaganda). At some point, toward the end of September 1944 (between the 23rd and the 28th), massive transports were announced and carried out. Over the period of a month, beginning on September 28, 1944, more than 18,000 people, many of them long-time prisoners, were sent to the East - Auschwitz - and most of them were immediately murdered. Let us narrow down our questions about the past to just a few, in this case, and see whether we can find out what the camp was like at the time of these transports, when people found out about them; whether they knew what was waiting for them at the end of the line and how they might have responded to that knowledge. Even if we look at all the available evidence, it is perilously difficult to find an answer. It is likely that some people in Terezín knew what was waiting for them in the East. But we do not know exactly which ones, nor do we know how they processed the information, what it meant to them. We know, for example, that at least at first, the vast majority of people actually refused to believe that there could be such things as conveyor belt death factories. And who can blame them? I recently had the opportunity of interviewing two women who were there at that time. Both of them are brilliant, honest and highly alert. One of them said to me: Nobody knew anything. We lived from day to day. The other said, Everyone knew. It was impossible not to know. That is history. The goal of this essay is to see what happens when we try to use the manuscript of a musical composition as a document that might contribute to the process of trying to answer our questions. Is it a document like other documents, or is music forever bound to be a special case? When we look at this manuscript, are we mostly hoping for affective evidence, whatever that might be, or are there other categories of evidence available to us, depending on how we look? My chosen piece is Gideon Klein's Trio for Strings, which, so far as I know, is the last major work composed in Terezín. According to notations on the manuscript, it was written precisely during the days in which the transports were announced and carried out. Note: according to notations on the manuscript. This is not the same as saying that the piece was created in those days. In calling attention to the difference between the two formulations I am reminded of Robert Heinlein's Stranger in a Strange Land and in particular the author's invented profession of Fair Witness. This is someone trained to observe the world without making what, for the rest of us, would be normal assumptions. Asked, for example, What color is that house? the Fair Witness answers: It's white on this side. So when I say that Gideon Klein's Trio for Strings was written during those days, I am merely stating that the dates on the manuscript coincide with this period. It is possible either that the dates are mistaken or purposely misleading, or that they represent only the writing down of something that had long been germinating in the composer's imagination. Not everything, but almost everything, is possible. As a historical document, the Trio poses many of the same questions as any other shred of the past: Is it genuine? What do we know about its creation? What kind of information does it contain? What can we say for sure about it? (The answer to this last question is always: far less than we think). Then we have a host of questions pertaining particularly to musical scores: Can we use language to describe what we might call the blueprint of the score and its realization in performance? Should that which the document contains be seen in relation to the real world, or is there another kind of relationship to pursue? If we sense such things as point of view or emotional quality in the document, is that to be considered a representation of the composer's point of view or his view of reality, or should we assume, say, that artists wear masks and draw no conclusions about personal expression? When we find moments that appear to be highly expressive in some way, how much is evidence of authentic personal engagement and how much merely shows a technical understanding of how to create certain effects -- or are the two forever intertwined? These questions can keep us up at night, so we will narrow the field a bit more. The second movement of the Trio has a completion date of September 21st marked on the score -- at least a week before the transports began and before they were announced. And yet the mood of the movement is unremittingly tragic. Is it possible that the musical content tells us something we cannot otherwise know: that everyone in Terezín, or at least Klein, knew exactly what was happening? In other words, let's imagine that we have two things. One is a piece of paper that we can, in our thought experiment, agree is in Klein's hand, dated September 21, 1944, and that says: I, Gideon Klein, know that I am to be sent to Auschwitz within a few weeks, and I know exactly what is waiting for me there. I am frightened. And the other is the score of the second movement. What might each of them tell us? We normally assume that the note is telling us some facts which, in connection with other things known, allow us to say what happened. But since what happened has value and meaning only insofar as it ties in with some aspect of human consciousness (those vexing trees falling the in middle of paradoxical forests…), it cannot be of value to us, really, unless we understand what we might call its tone. That is, unless we can determine whether it is ironic or desperate, uttered with vigor or despair, horror or resignation. One could go so far as to claim that, in and of themselves, any so-called facts gleaned from this fictitious document are dangerous, because they immediately allow us (encourage us?) to become involved in the process of erecting a false reality that we will all too quickly come to think of as in some way objective. The second movement of the Trio, on the other hand, gives us information of other, different kinds. In effect, we have the opposite problem: if we need affect to interpret the written statement, it might seem that we need some kind of statement to interpret any document-like aspects of the movement. So, we must ask, do any conventional facts - statements - emerge from the score of the second movement? The answer in this regard is yes, and we may begin by dividing our information into material that uses letters and numbers, and thus corresponds to our normal sense of factual information, and other kinds that come to us via musical notation. The former kind of information is most illuminating at the beginning and the end of Klein's second movement, as well as at one point near the middle of it. 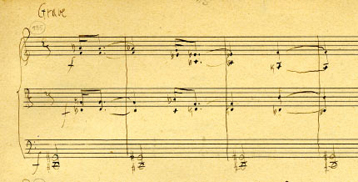 At the beginning of the movement the Roman numeral II is followed by the words (in Czech) Variations on the Theme of a Moravian Folk Song; the end of the movement is dated September 21, 1944,; but a passage in the middle calls attention to itself by its conspicuous chain of expressive markings: Con gran espressione, quasi improvisato senza rigore and, further, forte and con sordino (muted). In addition to these indications, all kinds of other information may be pertinent to our particular inquiry: internal expression markings, on the one hand, and, on the other, passages that refer to other works. Before we consider these different kinds of material, let us return for a moment to the Trio and its likely dates of composition. We have three dates at the end of the movements: September 5, September 21, and October 7. If we allow roughly two weeks for each movement (sixteen days for the second movement, fourteen for the third), it follows that Klein probably started work on the Trio sometime late in August, although of course, he could have started the work at any time before the date on the manuscript - even years earlier. At any rate, there is no evidence for the Trio's existence before September 5. I have not been able to find any indication that anyone knew anything about major transports at that time, though they may have been suspected. The second movement was written just as the High Holy Days began, finished three days after Rosh Hashanah and a week before Yom Kippur. Since we know that the first major transport went out on Yom Kippur, September 28, it is probable that the final movement was written just as the emptying of the camp, finished a few weeks later, was beginning. Klein himself was put on a transport leaving Terezín on October 16. There is one additional anomaly to consider. The dates seem to indicate that the second and third movements were written in roughly equal amounts of time. This would make sense but for the fact that the second movement is twice as long as the outer movements combined and is far more intricate in structure. I do not mention this to propose a solution, but rather to roil the field of understanding so that we realize how challenging this endeavor really is. Other scenarios must also be considered. The manuscript that survived is clearly the end of a process, not the beginning. Any sketches or other preliminary sources for the piece are missing. It is likely that the dates given show when each movement's final draft was completed, rather than the date of the fair (final) copy of the manuscript. 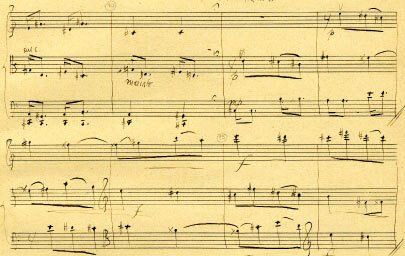 Which might mean that the final copy could have been made just before Klein's transport (he may have understood that he was about to be sent off and needed to complete the score quickly) and, further, that small changes could have been incorporated into the final copy without changing the original dates. Thus a passage could have been added in response to events and inserted into the final copy. 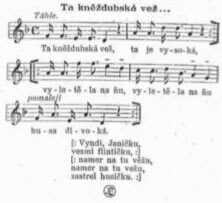 Despite the difficulty in verifying various kinds of evidence, it is easy to connect Klein's designation of the Theme and Variations on a Moravian Folksong with a melody known as Tá kneždubská vĕž (The Kneždub Tower). There is no doubt that this is the tune used; it is preserved in several folksong collections from as early as the beginning of the nineteenth century and it is also found on recordings. That level of certainty, however, stops precisely where we would crave additional information. Thus we do not know why Klein chose this particular song - whether for its tune, its personal value to him, to comment broadly on his situation by referring to its text, some combination of the above, or something else altogether. In fact, like all such songs, this one has multiple textual variants, and we have no clue as to which text Klein might have known, if indeed the text is at all significant in this case. So if we are going to suggest that the text of the song is an important part of the document, we are on fairly solid ground if we stick to the first verse. And we might conclude that such images as high towers and the image of the wild goose, a common symbol of freedom in Moravian folklore, resonate somehow either with Klein's personal condition or with his desire to make a broader statement about the collective. Stay well and farewell you beautiful girls. Johnny bring it, bring the rifle, aim at the tower! He shot at the goose. He shot the goose and shot it again. It is extremely tempting to argue or assume that Klein was certainly aware of these more specific references to violence and betrayal, and it would help to explain why he chose the song, yet this kind of data falls into the category of the unknowable. Nevertheless,the song offers suggestive images of a tower, wild geese, and a heartfelt farewell, and these we cannot ignore in trying to imagine what Klein might have wanted to communicate. If the words at the beginning of the inner movement lead to a particular Moravian song that supplies musical and textual parameters, the symbolic notation at its conclusion provides another combination of straightforward information and vexing questions. As we have noted, the composition is listed as having been completed on September 21, 1944. If this is true, then again, the movement was certainly begun and almost as certainly finished well before the transports began and even before they were announced. Thus the movement could not be a response to the almost certainly traumatic, specific event that followed its composition by a week or so. Of course, in historical investigation nothing is that straightforward. Since, as we have noted, it is likely that the piece had an earlier version, in the form of either sketches or an early manuscript source, or both, the dates at the ends of movements might simply indicate when a first version was complete, for reasons of both convenience and security; a date for other added materials, which could have been a response to more recent events, may have been omitted. A more dramatic hypothesis is that the threat of transports could have prodded Klein to complete something that had been sketched and planned for a long time. While that which precedes the opening of the movement, and follows its closing, provides parameters concerning the source material and date of composition, the elaborate expressive instructions in the middle of the movement are conspicuous enough to allow us to conjecture that this passage is to be construed as special, at least to the performers charged with conveying the composition to us. But what this means, and in what way it might be special, is as tricky an issue as can be imagined . The moment is a kind of cello speech/song interruption punctuated by sospirando sighs in the violin and viola. It begins with a two-octave plunge to the depths and then rebounds, only to make a much shorter chromatic descent a few measures later. Does this moment in the composition tell us anything that helps us to answer our questions about Terezín and its transports? Can we argue that the urgency of the interruption and the agony of the descent are a kind of personal interjection, a shift from a more objective style to something like direct speech, as if the composer were grabbing you by the collar, shaking you and saying, No, really, it was this way!? Is the chromatic descent intended as a traditional emblem of lament? Again, does such a moment constitute evidence of anything, and, more specifically, does it help in any way to clarify the question we raised at the beginning? In short: Did Klein know where he was going, and what did he make of that knowledge? We will come back to this issue. But first, we should ask whether other aspects of the score suggest that a hidden message is concealed within. In addition to the clear reference to a specific folksong, indicated by the movement's title, there are several possible allusions to other compositions, and the most tempting one is at the end of the first variation. Instead of a more conventional procedure, in which the variations gradually distance themselves from the theme, the first variation almost immediately loses the folksong in favor of a three-part canon. The song concludes with a downward trajectory, but the end of the first variation rises. Taken together, and considering possible sources, we are drawn immediately to the first song of Mahler's Kindertotenlieder. Caution must rule, however. We must be extremely wary of giving preference to the stories we would most like to tell. In this case, the idea of secret messages, especially those bravely composed in the line of fire, is quite attractive. So when we identify what we think we would like to find, we must work against it, keeping in mind that there are things we do not know and in all likelihood will never know. Another constellation of material at the end of the movement also arouses curiosity. The penultimate variation is actually two variations in one, the first in triplets, the second in sixteenth notes, as if Klein were somehow referring back to baroque variation technique. More compellingly, the piece seems to gather itself into a powerful unison passage, ascending in a crescendo until it comes rolling down in a ritardando that leads to the final variation. This segment, marked Grave, has a dirge-like character, and the dotted rhythms of the theme now suggest a funeral march. This passage recalls Suk's Asrael Symphony, and specifically the moment when the Angel of Death appears. Putting it all together—the song text, the allusions to other works, the expressive codes--we may decide that the variations movement is filled with images of death. 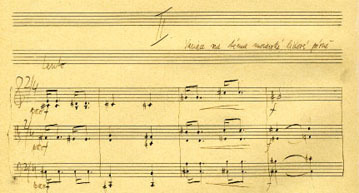 The expressive passage we have noted in the center of the movement, an example of what we might call direct musical speech, may be a reference to the Verdi Requiem, which Klein had accompanied for the better part of a year. Yet we need to remind ourselves that when this movement was completed, on September 21, no transports had been announced in the camp, and, according to documents, none took place there between May 18 (when 2,500 people were sent to Auschwitz) and September 28. Does this mean that nothing in the second movement refers to these transports? Let us resist reaching this conclusion until we have taken a brief look at the Trio's final movement. Again, if we take the dates at face value, we conclude that the third movement was probably started after September 21. Although the date of composition coincides exactly with the transports, there is little on the surface of this final movement to suggest that Klein is somehow commenting on the horrific events around him. This is even more notable if we accept the final date of October 7 for the last movement's completion. In this case, during the last nine days of the Trio's composition, five transports carried roughly 8,500 people to Auschwitz. The camp must have been a scene of horror, and no one could have imagined that they would escape the train ride to the East. If it seems odd that the symbols and expressive depth of the variations movement was composed before the transports began, it is even more peculiar to find passages marked burlesco in the final movement. Many explanations are possible. No one, composer or otherwise, needed the threat and reality of transports to understand that Terezín was a world of death, and Klein's compositions reflect that reality. 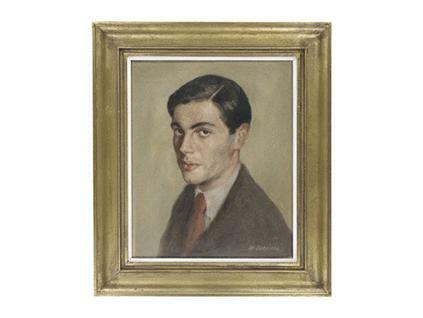 We should keep in mind the fact that in July of 1944 most of Terezín's finest artists and draughtsmen had been imprisoned, tortured and murdered, because their secret cache of real, rather than sanitized, images had been discovered. Many inmates must have suspected that after the Red Cross visit and the propaganda film, the camp would be liquidated. But this does not allow us to draw any conclusions about what Klein knew, when he knew it and what bearing, if any, it had on his composition. Two passage in the trio seem anomalous. The first one begins at Bar 67 of the first movement, which, according to the manuscript, was completed well before there was any knowledge of the forthcoming transports. Here, the piece's incessant forward motion seems to stop cold. The theme is distorted in the viola, and the cello plays an open fifth. 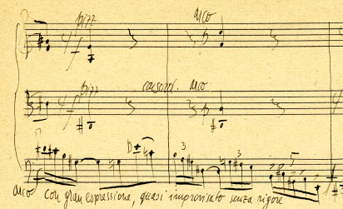 Although there is no dynamic indication, the passage is marked with the unusual words con espressione massima (with maximum expression), and the violin is instructed to play on the G string. What is happening in these measures, with their sudden chromatic turn, and what does it tell us about Terezín, Klein and the transports? The other anomalous passage is located in the final movement, which, again according to the manuscript, was written when the transports were already underway. At Bar 124 there are descending scales in the upper strings, an echo of a passage that first occurs at Bar 44. But unlike the earlier passage, which leads to two quarter notes and a cessation of forward motion, this scale leads to a kind of motoric moment, with a blending of meters. Until now the piece has been in 4/8, with an occasional 5/8 measure to extend a phrase. At this point, though, a completely new idea appears, and we have the only 6/8 measure in the movement. These two passages suggest another possible reading of the piece that not only fits in with events but may even say something about the composer's response to them. Let's deal first with the apparently less problematic finale. Its simple surface seems to conceal a series of musical quotations. The Schubert quote is the clearest, but there also appear to be references to Ravel's Tombeau de Couperin, Suk's Towards a New Life and perhaps even the devilish dance from L'Histoire du Soldat. While the designation burlesco at Bar 52 forecasts comedy or lightness, the indications marcatissimo and feroce suggest something altogether different. These allusions, taken with the calendar of events in Terezín, offer some evidence that the composer knew what was happening and took note of it. What of the first movement though? As usual, there is no definitive answer, but the anomaly of the expressive instructions and the character of an interruption may be explained by similarities between the bass line at Bars 68 and 69 (See Ex. 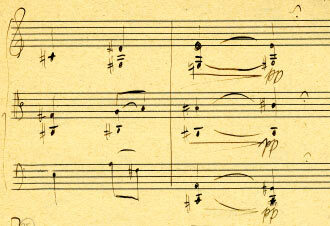 7) and the closing variation of the second movement, with its open fifth on the same pitches. Although it is possible that for purely aesthetic or musical reasons Klein wished to anticipate his final variations within the context of the opening movement, it is considerably more likely that this passage was inserted into the first movement after the second movement was completed. Here is a scenario for the Trio that contributes a good deal of information to what is sometimes called the historical record. Klein begins to compose the Trio, a relatively lighthearted work, in mid- to late August. It is possible that nothing happens to change the affect or intent of the movement throughout the composition of the first draft, and it in no way is meant as a reflection of events in Terezín. The second movement's overall concept feels like something that has been germinating for a long time. Everything, from the first variation canon to the careful use of the theme to the length of the movement (longer by far than the outer movements combined), leads to the assumption that this is the work's core. But it is possible that, insofar as those aspects of the work that touch the real world are concerned, the second movement is more a general comment on being a prisoner in Terezín than a response to current events. It is almost certain, on the other hand, that the last movement was written while events related to the transports were taking place. Finishing his work under these conditions, Klein makes his final changes; he goes back to the first movement and inserts an anticipation of the funeral march, which concludes the following movement. He may even have inserted other passages or changed details in the second movement as a response to what was happening. We do not know. And as if acknowledging that he will be unable to take many possessions with him on his journey, he instead packs a musical suitcase filled with various kinds of information and leaves it behind for us to peruse. In the end, two types of conclusions are possible. One could take the strong view that virtually no raw factual data that sheds light on events in Terezín can be extracted from the Trio's score, and that, compared to a transport record or a diary entry, the score adds nothing substantial to our understanding of events and conditions. But we could just as well argue that no other extant document delineates what was happening in Terezín as clearly, powerfully and variously as does this score, especially considering the kinds of problems it poses for those who seek to reconstruct the past. Because like the work itself, the full historical record of Terezín consists of what is known, what could be known and is not known, and what cannot be known at all. Like Terezín itself, the manuscript of the Trio is a landscape open to endless interpretations, but it is also a a work that could have been wrought in no other time or place. All content is copyrighted © 2010.